The moral to this modern divorce story? If everyone involved doesn’t emerge stronger, happier and more productive, well, then, in the vague parlance of today’s progressive preschool, someone is making bad choices. The notion that there’s some “right” choice for every life challenge fits neatly into the control-freak mind-set of our current moment. We’ve developed a real talent for transforming neutral or negative events into triumphant rites of passage. This may represent Oprah’s most enduring legacy: the relentless conviction that even the most unpredictable, unmanageable problems can be stuffed into the familiar packaging of “catharsis.” Rather than acknowledging residual pain or lingering trauma, we’re urged to embrace each story as a wake-up call or a breakthrough on the road to self-fulfillment. 2. Speaking of Heather, now that it’s over, everyone and their brother seems to be jumping on the Friday Night Lights bandwagon. To which I say, better late than never (I like to think we were pioneers in that regard – which, if the amount of FNL related articles that have been forwarded my way recently is any indication, we were!). Not only did the show finally receive an Emmy nomination for Outstanding Drama, and ESPN Classic announced that it would be re-airing the whole series, thoughtful editorials have been popping up all over the place. Grantland, The Awl and Relevant Magazine being a handful of notable examples. Also, don’t miss NPR’s wonderful coverage of the series farewell, which was broadcast today on the Fresh Air program and features interviews with the entire cast. Finally, for those about to go into Riggins withdrawal, look no further than the teaser trailer for John Carter, the upcoming adaptation of Edgar Rice Burroughs’ sci-fi epic from director Andrew Stanton (WALL*E). 3. Mark Oppenheimer in the NY Times chronicles more of the sad fall-out of Law-heavy evangelicalism (and natural theology) in his profile piece “An Evolving View of Natural Family Planning.” There’s not much to say that the article doesn’t imply, ht AZ. 4. Psyblog tries to explain “Why People Avoid The Truth About Themselves.” Hint: It’s not because of all inner beauty we might find (ht JD). When I was a child, I spake as a child”; “Eat, drink, and be merry”; “From strength to strength”; “Grind the faces of the poor”; “salt of the earth”; “Our Father, which art in heaven.” It’s near impossible to imagine our idiom and vernacular, let alone our liturgy, without them. Not many committees in history have come up with such crystalline prose. 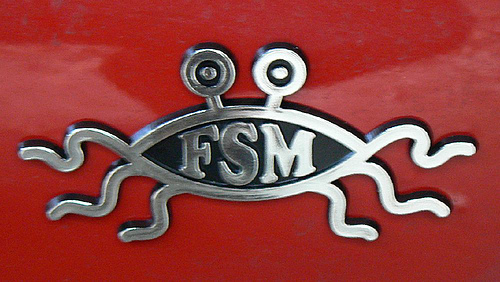 Also atheism-related is this clever little tidbit about “Pastafarianism,” ht JD. 6. In music news, October is shaping up to be a good month. Noel Gallagher announced the release of not one but two new records, the first of which will appear on October 17th. And Martin Scorcese’s long-awaited George Harrison documentary will air on HBO on October 5 and 6th! Too often it can be hard to see the human touch amid the industrial machinery, which hasn’t been true here. One reason the movies work is that their scale never overwhelmed the extraordinary characters, especially the wizards whose very ordinary habits, prejudices, quirks and fears made this fantastical world recognizable. Has anyone seen it yet? I’d love to hear how they handle the Christian elements. Not to mention any info about The Dark Night Rises teaser that’s apparently running before it. Salon ranks the 8 films here. Speaking of Batman, the trailer for the animated Batman: Year One looks pretty promising.